Child-friendly? If there's one thing that Pixar knows how to do better than anyone else, it's making a child-friendly film that's smart, funny and enjoyable for adults too. This re-release brings back all the original fun of Monsters, Inc. and throws in a healthy dose of 3D animation for flavor – all in anticipation of Monsters University this summer! Normally I can't help raising an eyebrow whenever I see a movie being released in 3D – much less a re-release. In my opinion, unless you're getting a three dimensional animation experience that rivals Avatar, there's really no reason to spend the extra money on a movie ticket. However, Monsters Inc. is one of my all-time favorite kids movies, and I'm thrilled to see Pixar bringing it back in 3D glory! It's hard to believe the original film – only Pixar's fourth – debuted way back in 2001, when the animation company was still cutting its teeth in the family movie genre. Since then we've had Finding Nemo, the Incredibles, Up! and WALL-E, so this is definitely an early standout in the Pixar canon. If you've never seen the film before, Monsters, Inc. tells the story of James P. "Sully" Sullivan (voiced by John Goodman), an enormous furry blue monster, and Mike Wazowski (Billy Crystal), a tiny, round and green monster with one eye. The pair work at the energy company Monsters, Inc., which powers the monster city by frightening young children and collecting their screams as fuel. 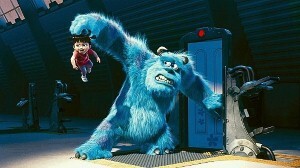 However, all the employees at Monsters, Inc. are deathly terrified of children themselves – believing them to be toxic. Sully and Mike enjoy their status as the company's top two employees, until a little girl inadvertently follows Sully into the monster world and causes all hell to break loose at Monsters, Inc. Even worse, the pair of monsters are charged as accomplices of the human child, forcing them to go on the run from the authorities. Meanwhile, Sully and Mike's biggest rival, Randall Boggs (Steve Buscemi), uses the opportunity to become the new top employee at Monsters, Inc.
Child-friendly? While the employees at Monsters, Inc may be after children's screams, the film is filled with laughs, warm moments and family fun. And now that Pixar has re-released the movie in gorgeous 3D in advance of Monsters University premiering this summer, there's never been a better time to introduce or re-introduce your kids to this classic. Recommended for children of all ages.